SysCADProjects This is a user created folder to store SysCAD project group folders. The root directory is not important. The user may wish to add this to their local computer drive or to a network drive. Client1 This is a user created folder to store SysCAD projects. Throughout the documentation, this folder will be referred to as the project group. For example, SysCAD projects done for Client 1 might belong to Client 1. In general, if projects share the same customised species database, they should be grouped together for better file management. 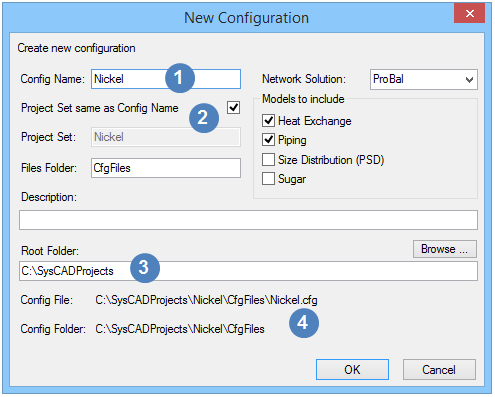 If SysCAD is shared across the network, the project group folder can be either on the server machine or on the local machine. In the Client 1 folder there are 4 subfolders. Client1\CfgFiles This folder is created by SysCAD when the user creates a new Project Configuration. The two most important files in this folder are the species database (SysCAD.93.db3) and configuration file (.cfg). The project specific SysCAD.93.db3 file is an SQLite database containing a species table and an engineering unit table that is relevant to all projects as part of this project group. See Editing User Species Database 9.3 for more information on the Species Database. The project loading data is customised via the Project Configuration (cfg File), saved with an extension cfg. Client1\Project1BaseCase.spf This is SysCAD project folder. When the user creates a project in SysCAD, the project related files are saved in this project folder. It contains the project.spj file, which is used to load the project; graphics files, trend files and other initialisation files. All model related data are stored in a Database called ModelData.db3. Client1\Project1Scenario1.spf This is another SysCAD project folder. In this example, it is the same project but for a different scenario. The folder is still in the same project group as it is still using the same configuration file and SysCAD.93.db3. Client1\Project2.spf This is another SysCAD project folder. In this example, it is a different project. The folder is still in the same project group as it is similar enough to Project 1 that the user wants to use the same configuration file and SysCAD.93.db3. Client2 This is a user created folder to store SysCAD project group folders. Client2\Nickel This is a user created folder to store SysCAD projects (ie. a project group folder). In this case, it is for Nickel for Client 2. Note that there is another folder called Zinc for Client 2. The referenced files are those written by the user, external to SysCAD. These include any Excel Reports, PGM files, reactions files, script files and driver files. The referenced files are normally stored within the project folder. Reactions - This is a SysCAD created folder, all Reaction files, .rct, are stored here. Controls - This is a SysCAD created folder, all PGM and Model Procedure files, .pgm and .mp are stored here. Reports - This is an optional user created folder, user can store all the report files here. Archive - This is an optional user created folder, user can store all the archive report files here. Scn - This is an optional user created folder, user can store all the scenario (.scn) files here. Script - This is an optional user created folder, user can store all the command script (.ssc) files here. It is a good idea to also store other reference files within the project folder as this will help to keep the project self-contained. It is up to the user to keep to a consistent format for good project management. Project group\cfgfiles: This folder is in the search path of SysCAD, i.e. full path is not required when entering the file name in SysCAD. User defined folders, eg. SysCAD93\Project group\Excel Files. These folders are not in the search path of SysCAD, when entering the file name in SysCAD, full path is required, or use the Browse button to locate the files. Backup.CfgFiles.2.zip The zip file will contain a copy of the cfg files used by the project. The purpose of this zip file is to keep the project self-contained. 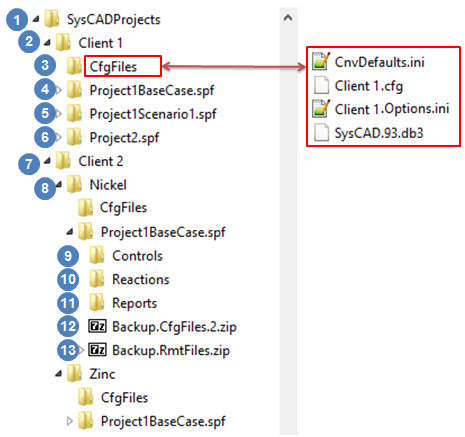 For example, when sharing the SysCAD project with other users, a copy of the configuration file and species database used can be extracted from this zip file, therefore, there is no need to zip up a copy of the CfgFiles folder manually to send with the project. Backup.RmtFiles.zip The zip file will contain all reference files (eg Excel Report, cfg files) that is not stored within the project folder. Files must have been used by the project to be added here. In the case of Excel report files, they must have been added to the Excel_Automation Dialog box for it to be linked to the project. User can now create a New Project Group + Project using the Project - New Project Group menu command. Please see this link (Project - New Project Group) for more information. Start SysCAD; make sure all SysCAD projects are closed. From the Edit menu, select Project Configuration. To create a new Project Group, Select New, this will open the New Configuration Dialog box. - If the configuration file name is to be the same as the project group name, tick this box. - Type in the root folder name. - Check the path is correct. Press OK to close the dialog box. Please note that the configuration file and database created using this method will contain only Water and Steam. User will need edit the database and configuration file to add more compounds. See Also Creating a New Configuration File. Alternatively, user can choose Copy in the Project Configuration Dialog box to make a copy of existing cfgfiles (from distributed example projects or existing model) while creating the new project group. See Copying an Existing Configuration File for more information. The process model developed in SysCAD is termed a SysCAD project and all data related to the project are stored in a project folder. This folder is marked with the extension spf (SysCAD Project Folder). We have looked at the structure of an example folder briefly in the previous headings. We now list all the possible files that may appear in the project folder. The master document file is given the extension spj (SysCAD Project). This file is generated when a new project is created and is used to reopen the project in SysCAD at a later time. A SysCAD project can comprise many files with different extensions, storing data related to different aspects of the project. Some data files are specific to one project, for example unit model data files, while other files can be shared between projects eg, chemical reaction files. Project specific files must be stored in the folder allocated by SysCAD. Shared files can be stored in any folder allocated by the user. To avoid housekeeping problems, care should be taken when storing shared files to directories. Table 1 outlines all the file types that can be part of a SysCAD project. *Drawing files can be created using SysCAD or a third party package that produces drawings in dxf format. **These files must be stored under the project cfgfiles folder. *** This file is stored under the Project Group Folder. File types in bold in Table 1 are created by SysCAD. Loosing a file marked as essential in Table 1 could lead to a corrupted project. Scenario, historian, report and other.dat files contain information that is derived from running the SysCAD project and so can be reproduced if required. Reactions, profiles, script files, general controller files, and PLC configuration files are external files generated by the user to control the way the project runs. The "models".cfg, SysCAD.93.db3 and ModelData.db3 files contained data related to the process model library (tanks, pipes etc.) and species loaded on start up. These must be present. To zip up a SysCAD project, simply add all files under the project folder including all sub folders. This page was last edited on 30 November 2017, at 23:01.